Version 18.07 is now available for DOWNLOAD! Changed shortcut for Add Video Track to Ctrl+I (Cmd+I on macOS). 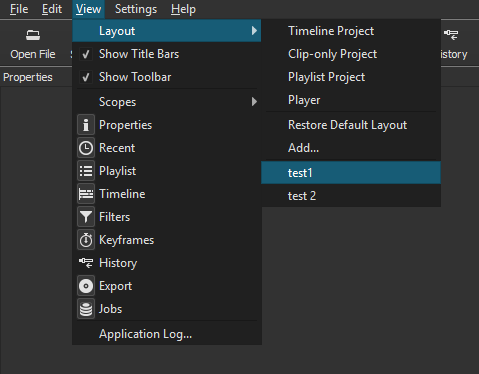 Below is a screenshot showing the new View > Layout menu. When this feature was added in the previous version 18.06, it would reverse an entire file. If you just wanted to reverse a trimmed shot, then you had to manually export it as something and then open and reverse the result of that. Moreover, many formats do not work well to seek each frame backwards and would give poor results. This new version takes care of both of those by adding two jobs: convert and reverse. The convert step also performs trimming using the in and out points from either the clip in the Source player or a clip selected on the Timeline. The reverse job automatically deletes the intermediate result of the convert job. Often you want to export a portion of the timeline - whether to preview it, troubleshoot an export problem, or to so-called “bake” effects. This could be done previously by saving the project, using File > Open MLT XML as Clip…, trimming this virtual clip in the Source player, and then export the trimmed virtual clip. This new menu item in the Timeline menu simply makes that more convenient and also works with an unsaved project. It simply opens a copy of the current timeline project in the Source player where you can trim and then export (make sure to check Export > From).